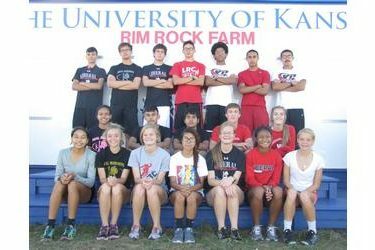 The LHS cross country teams competed in the Kansas High School Cross Country Championships on Friday. The meet was held at Rim Rim Farms, the home cross country course for the Kansas Jayhawks. The young Lady Redskins came into the meet with only three returners from last year’s state cross country team, consisting of sophomores Cam Slatten, Yanelly Jurado, and Saw Ahmara. Slatten continued her impressive sophomore season as she finished 18th for a spot on the All-State team with her time of 16:10. Jurado was the next Redskin runner to cross the line with a time of 16:55, good enough for 52nd in the state. Ahmara who has been battling some foot and shin injuries was able to run through them to finish 79th place with a time of 17:42. Freshman Kelsey Ramsey continued her impressive end of the season run as she was Liberal’s 4th runner with a time of 17:50 in 82nd place. Ramsey was Liberal’s 14th runner to start the season off. Freshman Tania Minjarez placed 85th, crossing the line in 18:03. Freshman Reyn Slatten was the 100th runner to finish the race in 18:59, while sophomore Karen Hernandez was 102nd in 19:10. The Liberal Redskins finished in 11th place, while St. Thomas Aquinas dominated the team competition as they almost duplicated their perfect score from last year with 19 points. Lenexa St. James was second with 103. The boys were led by senior standout Obed Quintana who was seventh a year ago at the state meet. Quintana could have run a conservative race and went for another top ten medal, but instead he went for the win. Quintana went with the race leader for the first mile, but started to die out during the second mile. Quintana’s final time of 17:03 placed him 29th place. Senior Ivan Aleman ran his season best time on the tough course in 17:30 placing him 43rd place. Sophomore Juan Beltran ran a personal best time as well with 17:46 placing him 56th place. Junior Greg McClurg clocked a time of 17:51 which placed him 58th. Senior Jerry Valdez finished his last race in a redskin uniform with his best time of 18:22 in 75th place. Freshman Dusty Torres was the 79th runner to finish the race with a time of 18:28, while junior Alex Chance ran the course in 18:29 placing 80th. The Redskins finished in 9th place in the state meet, while St. Thomas Aquinas earned the 5A sweep. Blue Valley West got the runner-up with 81 points, making it the first time since 2007, that Aquinas and Bishop Carroll were not the top two teams in the state. Bishop Carroll was third with 107 points. The season did not end the way we would like but we were able to find a lot of bright spots to build on for next year, and we will look at our mistakes to correct and get back to where we know we can be next season.